Everyone has facial hair. For some, it's almost invisible and goes unnoticed. But for some people, facial hair makes it difficult to apply makeup, even after exfoliating. If you're comfortable with your facial hair, then there's no need to read on or change your habits. But if you'd rather not deal with it every time you apply makeup, the following tutorial will help you learn how to safely eliminate it at home. Contrary to what a lot of people think, many women, including skin care gurus, actresses and models, shave their faces regularly. Shaving removes unwanted fuzz and also exfoliates the skin, making it feel smoother. There are some important do's and don'ts to remember, though, so watch the video all the way through before trying this at home. Important tip: do not shave any areas with active acne blemishes. The skin is fragile, and you could cause an infection. 1. Before shaving, wash your face with a gentle cleanser and pat the skin dry with a soft wash cloth. 2. Apply a few drops of oil or shaving cream to the skin that you will be shaving. This will minimize irritation. 3. Sterilize the razor by wiping it with an alcohol-soaked cotton pad. 4. Hold your skin taut and hold the razor at a 45-degree angle with the blade pointing toward your jaw. Shave in short strokes in a downward motion. Tip: do not shave upward because this will cause irritation and potentially result in ingrown hairs. 5. Remove the oil from your face with the wash cloth. 6. Using a facial brush or your fingers, apply facial lotion or aloe vera gel to the shaved area to reduce redness and restore moisture. 7. If you want to apply foundation immediately, use a damp beauty sponge to apply it. The moisture in the sponge will not aggravate freshly shaved skin. 8. Set your foundation with setting powder and a powder puff instead of a brush. 9. 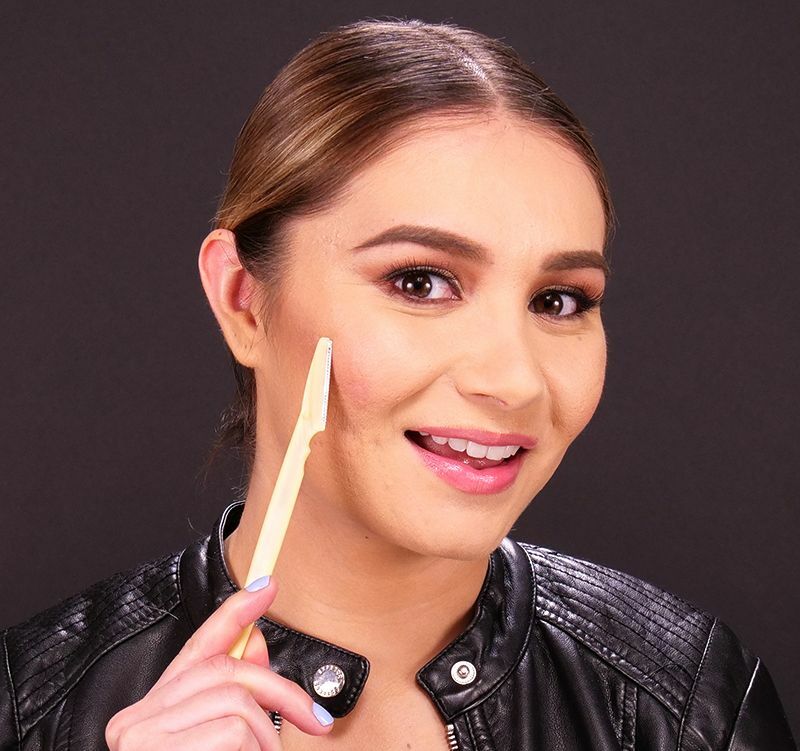 Apply contouring powder in the hollows of your cheeks with an angled cheek brush. 10. Sweep blush onto your cheeks with a fluffy cheek brush. While shaving isn't suitable for everybody, it can make it easier to apply makeup while also making your skin feel baby soft. Share these shaving and makeup tips on Facebook.